We give on the water tuition on how to use a sounder to locate fish and demonstrate different casting and retrieval methods to help you with your strike rate. Includes - Pick up in the local area. Six ( 6 ) hours fishing time on the fabulous Lake Proserpine with all fishing tackle and guide provided. 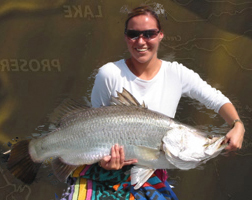 Barramundi are a heavy duty fish and heavy duty tackle is mandatory so the boat is equipped with quality Rods and Reels. We use 15 kg and 24kg braid and have a good selection of heavy duty deep diving and shallow running lures. We serve light refreshments and snacks. Wet season can run from the end of November through to the end of March. In summer the humidity is very high and you can expect to experience the odd heavy shower. Sun protection is essential and sunscreen is available on the boat.